Made using the Actual and Original 1969 Woodstock Fence! Made from the Original 1969 Woodstock Music Festival Fence! This is a 2″ peace pendand made from the original 1969 Woodstock Festival Fence. Each pendant is hand crafted here in Bethel, NY by Joey Alexy. The size is 2″ diameter. Own a rare peace of the actual fence that surrounded the concert site here in Bethel, NY in 1969. Attendees trampled the fence down, and promoters decided to make it a free concert, which was the largest gathering of people in one place at that time. Includes a certificate of authenticity! 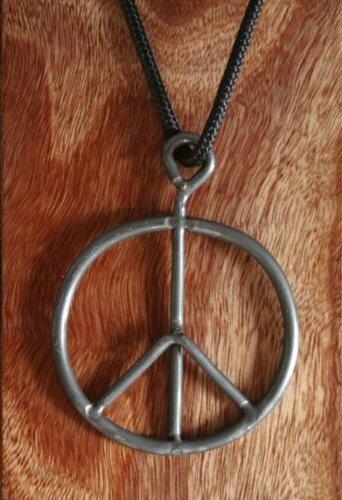 Each of our PeaceFence.com pendants is made using original fence from the 1969 Woodstock Music and Arts Fair in Bethel, NY. Pendants are shipped with a notorized certificate of authenticity stating that they are in fact made from the actual and genuine Woodstock Fence. These rare pendants are 100% guarenteed to be made from 40+ year old fence that surrounded the Woodstock concert site. Authenticated by The Museum at Bethel Woods! A section of the Alexy Family’s fence is currently on display at the Museum at Bethel Woods, as seen in the third photo. This artifact is the same fence that we use to make Peace Fence pendants. This Museum has the largest collection of Woodstock Festival memorabilia in the world, and the experts there have authenticated our fence to be the real thing! Do not mistake Peace Fence products with the multitudes of Woodstock Festival replicas out on the market today, many being sold as real. Thanks for looking at this opportunity to own a rare and unusual peace of history!